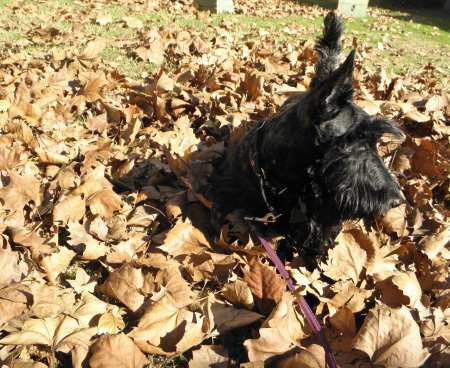 Evangeline, being a young and impressionable Scottie puppy, believes what she sees... and ALLLLL of what Riley TELLS her! Soooo, it was guaranteed that the tale he spun for her would be snapped up, munched on, and swallowed whole! Riley, nearing 12 years old, had been raised by the Wild Child... so nothing surprised him. He'd LONG ago learned how to get the MOST out of a situation with the least amount of effort. As Katie had showed him, it was ALLLLLL in the PRESENTATION! Fall had finally arrived on the Bayou, the leaves were fluttering from the trees in growing numbers, turning the grass into a carpet of brilliant orange and red. These leaves, when caught up by the soft breezes, had caught Vangie's eye, and had become a daily obsession. The moment was ripe for Riley to weave a tale for the young lass, one that would keep her interest on the YARD and the leaves....and away from HIS treat-loaded Kongs. Seeing her eyeing a bright yellow leaf twitching in the soft breeze, Riley cleared his throat, stepped up beside Vangie, and whispered conspiratorially into her furry ear. "I'd think twice about leaping on that leaf. You DO know about the Pixies... don't you??" Riley raised one distinguished eyebrow wisely, gave Vangie a knowing wink, and strolled away to the nearby willow tree, where he assumed an appropriately distinguished pose. He KNEW it'd only take a SECOND for her to react.. he waited. Within seconds, Vangie came TEARING across the yard, tail erect, paws at full throttle. She skidded to a stop right in front of Riley, stirring up a cloud of grass, twigs, and leaves in her approach. "WHAT pixies?? WHAT?? HUH??????? Tell me... tell me!!" Vangie's eyes glittered with eager excitement, as she pinned her gaze on her hero, waiting for the wisdom and knowledge she knew he was about to share. Riley shifted one paw, tossed his lush beard in the wind, then looked suspiciously around the yard, left then right, before leaning back toward Vangie. "Shhhhhhhhhhhh, you can't let them know you KNOW! The LEAF PIXIES.. They're sneaky little sprites, they have a wicked sense of humor...and can surely make you CRAZY in the yard! It takes a WISE pup to outsmart them." Riley paused, gave Vangie a long, doubtful gaze... "I dunno... you might not be ready to take on the LEAF PIXIES!" Looking away, Riley hid his mirth. He HAD her on the hook now, he knew she'd 'bite'! "I CAN! I KNOW I can! Tell me 'bout 'em!! I CAN, I PROMISE!" In her excitement, she'd grabbed a mouthful of Riley's furnishings, tugging furiously. Riley quickly leaned out of reach, then hurried on with his tale, to distract the little imp. "Welllllll, the LEAF PIXIES hide UNDER the leaves. They are TINY, tiny sprites, who are always up to all sorts of mischief.. And you never know WHO or WHY or HOW!!!" Riley paused, enjoying the wide-eyed concentration on his audience's face. she was hanging on his every word. GOOD! "Look over there. See that leaf SEEMINGLY blowing across the yard on the breeze??" Vangie nodded, her eyes locked on the leaf in question. "Welllllll, it's not the WIND moving that leaf. There is a LEAF PIXIE under that leaf, tiny little sprite, incredibly strong. Now, if you were to go over there and GRAB that leaf.. ohhhhhhh, say, to play with it... well, that wicked little LEAF PIXIE would reach out from under that leaf and YANK your beard.. or jump up and flutter a blade of grass in your ear.. or hide in your fur and WHISTLE at you... or worst of all, knot the leaves into your furnishings!!! Yessiree, those LEAF PIXIES are sneaky little creatures! They'll GETCHA!!" Vangie's eyes, wide with wonder, glanced from Riley's wise face to the nearby leaves who now seemed to have taken on a life of their own. "What do I DO? Can't I Play in the yard? Will they GET ME? How do I handle them?" Vangie now had a look of fierce determination. She wasn't about to let a mere LEAF PIXIE ruin her yard fun! "Okay, it's a bold move.. But I think you can do it. When you THINK you're about to be "LEAF PIXIE'D", run UP to the leaf, flip it over... NOW, THIS is the IMPORTANT PART... STOMP the leaf with your left paw, then quickly SNEEZE on the leaf, but be SURE you do NOT step on it with your RIGHT PAW! That only creates ANOTHER PIXIE! REMEMBER THAT!" Vangie nodded excitedly, then leaped to her feet and raced across the yard to the nearest leaf that showed signs of having a LEAF PIXIE..... "LEFT, not RIGHT.... LEFT, not RIGHT!" she mumbled, over and over. Riley smiled broadly, relaxed.. "LEAF PIXIES?!?!" hahahaha He planned to spend the remainder of the afternoon watching Evangeline race around the yard, flipping leaves over, stomping on them, sneezing repeatedly... leaf after leaf after leaf. Across the yard, Vangie turned and waved at Riley. Glancing behind him, she spotted them.. 4 leaves, all in a perfectly straight line, approaching Riley from the rear. Vangie CONSIDERED warning Riley.. "LEAF PIXIES!" But, Riley was an expert... No LEAF PIXIES would DARE sneak up on RILEY!!! HE knew what he was doing! She turned, and resumed her task of clearing the yard of as many LEAF PIXIES as possible. Riley chuckled. "Gullible girl, she'll believe ANYTHING! " he thought to himself.... "sure does make for a FUN afternoon's entertainment, though!" Smiling, Riley settled into the grass to enjoy the show. "LEAF PIXIES! How funny!"